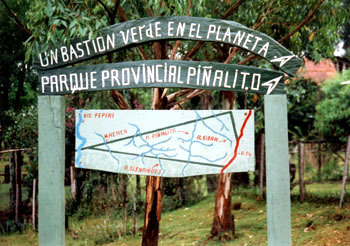 The Province of Misiones is a narrow thumb of land projecting northwards from the body of Argentina into a gap between Paraguay and Brazil. It is bounded on the west by the River Paraná and on the east and north by the Rivers Uruguay and Pepiri Guaçu. 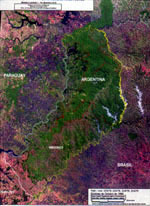 In the satellite photograph, the green areas are forest, the white and yellow lines are the boundaries of the Province and areas appearing as pinkish or greyish are either agricultural land or have been deforested and are mostly bare rock, the soil having been washed into the rivers, killing almost all of the river life. On the full-size image, an arrow shows the approximate postion of the new Provincial Park which was bought by the Cat Survival Trust. Misiones has a greater proportion of its land (18%) protected than anywhere else on the continent and ranks among the best-conserved places on the planet. The protected area will be still further increased when the 200 Km. Green Corridor, for which legislation has just been passed, is completed. Much of the credit for getting the legislation for the Green Corridor through the Provincial Assembly must go to the Minister for Ecology, Snr. Luis Alberto Rey, whose hard work and enthusiasm, making full use of the information and advice provided by The Cat Survival Trust, ensured a successful outcome. The corridor will link many existing protected areas, enabling wildlife to travel freely between them and so helping to prevent populations in small, isolated areas from becoming inbred. 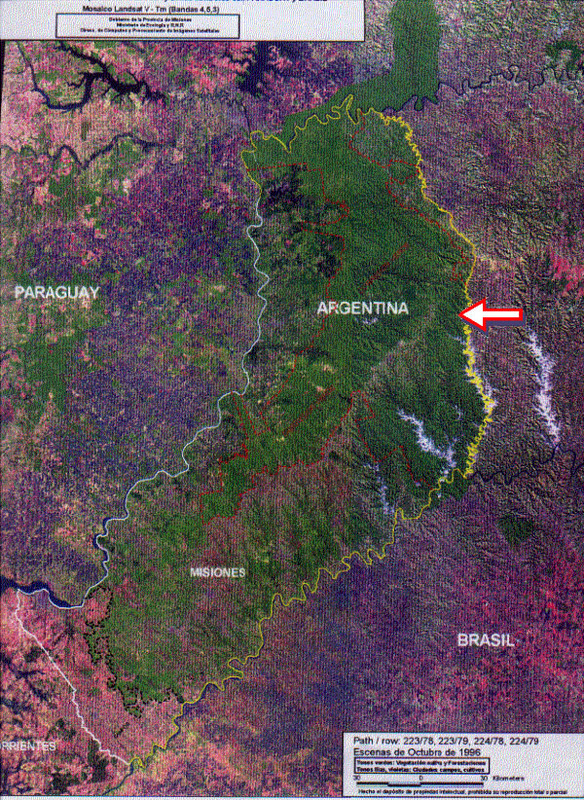 The land purchased by The Cat Survival Trust consists of a long, narrow triangle with its base on Route Nacional 14 and its apex almost on the Brazilian border. (In the map on the sign, South is to the top and East to the left - it is in the Southern Hemisphere!) The total area is 3,796 hectares. With the exception of one small area, the whole park is covered with virgin forest through which flow many small streams. These latter are almost the only unpolluted water in the area, the soil erosion which inevitably follows deforestation having choked almost all the other watercourses, destroying most of the life in them. Of special interest to the Cat Survival Trust are the five species of cats which live in the park: jaguarundi, ocelot, margay, puma and tiger cat. These represent half the species for the whole of South America. Jaguars, which used to be found in the area, disappeared about ninety years ago. Initial work in the park has revealed four species of orchid which appear to be new to science, two previously unknown edible fruits and one species of bird never before found in Argentina. The tree ferns shown in the picture were previously thought to be locally extinct. Over fifty plants found in the area are considered by local people to have useful medicinal properties. With so much found in the first few months of the reserves existence it is no wonder that the message sent back by the man who visited the land on the Trusts behalf prior to the purchase was This land must be saved at all costs!. Although badly in need of updating, the lists of species notified to us as having been found in the reserve shortly after its acquisition give some idea of the diversity of its wildlife. Unfortunately the observer who sent us the information is mainly interested in birds and mammals! Follow the links below to the lists. The purchase of 10,000 acres of virgin forest in north-east Argentina by the Cat Survival Trust in 1992, to protect endangered species of cat, has benefits for all the species of fauna and flora in the area. This project preserves five million trees, billions of insects and hundreds of thousands of plants, birds, mammals, reptiles and fish as well as the original genetic stock of fruit, seed and natural medicine bearing plants. It also protects water springs and courses, provides water to ripen crops on farmland downsteam and helps stabilize the local climate.